Ascorbic acid, or vitamin C, aids in many functions of the body. 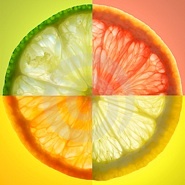 Vitamin C promotes a healthy immune system, helps wounds heal, maintains connective tissue, and aids in the absorption of Iron. Large doses of Vitamin C do not usually cause toxicity because, as a water-soluble vitamin, it is simply excreted in the urine. People who tend to form kidney stones may find their condition aggravated by vitamin C supplementation or mega–dosing. Also, persons who have health problems related to excess free iron in their cells may want to consider avoiding highsupplemental doses of vitamin C. Too much Vitamin C can also cause diarrhea. If this happens, just cut back a bit on the supplements. Please remember that all of the above toxicity–related issues involve vitamin C in supplemental form, not as it naturally occurs in food. Try to get a lot of your Vitamin C from your diet. A deficiency of Vitamin C can cause a condition called scurvy; a nutritional deficiency disease characterized by weakness, anemia, bruising, bleeding gums, and loose teeth. Though scurvy is rare in North America, poor wound healing is not. Poor wound healing can be a symptom of vitamin C deficiency. Weak immune function, including susceptibility to colds and other infections, can also be a telltale sign of vitamin C deficiency. Since the lining of our respiratory tract also depends heavily on vitamin C for protection, respiratory infections and other lung–related conditions can also be symptomatic of vitamin C deficiency. There is another form of Vitamin C that is fat soluble. It is ascorbyl palmitate which is an ester formed from ascorbic acid and palmitic acid (a saturated fatty acid) creating a fat–soluble form of vitamin C. In addition to its use as a source of vitamin C, it is also used as an antioxidant food additive. Ascorbyl palmitate is also marketed as “vitamin C ester”. Rosehips are an excellent source of Vitamin C. Boil and use this water to make your tea. It can also be found in tincture form.